Tea drinkers will be delighted with these bud-like packets that "bloom" slowly when steeped. Simple and sophisticated tea drinkers alike will be delighted with these bud-like packets that "bloom" slowly when steeped. Three captivating varieties- peach green tea, jasmine green tea, and chrysanthemum green tea- are hand-sewn in China to create artful "flowers" that each yield a delicious pot or several cups of tea. Each glass jar contains a sampling of the bud varieties. Tea grown and buds hand sewn by artisans in China; samplers hand assembled by Sierra Zamarripa in Brooklyn, New York. Click here to see how the Blooming Tea buds bloom. Ever since she was a crafty kid living on the Lower East Side of Manhattan, Sierra Zamarripahas loved making things. As she grew older, she began to marry her passion for creating with caring for our planet (she ended up studying sustainable development in school). Eventually she opened up her own studio in Brooklyn with her mother, where the two and their team make handcrafted, earth-friendly gifts using low-impact materials. Keep tea enclosed in glass jar when not in use. Each set contains 5-6 caffeinated tea buds. I am hoping my sister loves this gift! It looks beautiful in the advertised picture, so I am keeping my fingers crossed that it actually works the same, and there is a wonderful flower that yields a delicious pot of tea when finished blooming! I bought this as a gift for my best friend and he absolutely loved it! Now I need to get this for myself! Very cool to see the flowers open up. I purchased this product as a gift. It was loved by the receiver, who thought it was very aesthetically pleasing. The flower is a fun surprise, and expands slowly for about 20 minutes. I gave this to my mother in law as a gift and she loved it, she already had the pot for it. I would highly recommend this for any tea lover. Beautiful and Delicious! Made a beautiful gift! My girlfriend loves this tea. The packaging was particularly awesome. Great gift. Was very disappointed that when my order arrived, the teapot pictured was not included. Had to purchase the teapot separately, but the teapot didn't arrive in time for Christmas. I had to give the teapot to my daughter well after Christmas. 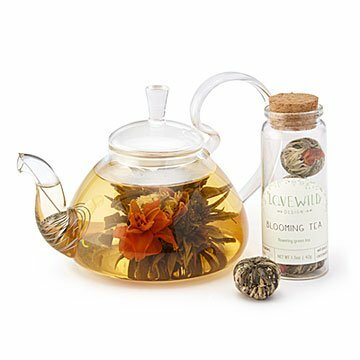 If you are buying these to watch the tea "flower", be sure to buy a clear teapot as well.